What better tribute could any father receive than his own face carved into a giant watermelon? Carving a watermelon dad for Father�s Day is sure to create laughs and one sweet memory for dad. 1. Start by slicing off the top of the watermelon just like you would do for a pumpkin when making a jack�o�lantern. 2. Let the kids use the ice cream scoop to shovel out the sweet insides. Set aside scooped melon to serve with watermelon dip or to puree for delicious watermelon fruit pops (recipes below). 3. Have a child use a pencil to draw a picture of dad�s face on white paper. Flip the paper over and trace the face again on the other side. Then flip it back and use it to rub and trace your design directly onto the melon. 4. Adults Only! Use carving knife to cut design into the hollow melon. There are many uses for a Watermelon Dad. 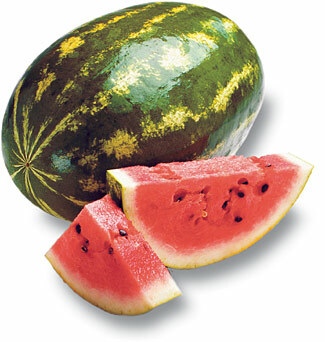 You can return scooped melon balls to the inside along with other tasty fruits and use the Watermelon Dad as a fruit-salad serving dish or just place a lit candle inside and use as a Father�s Day Centerpiece. Blend ingredients in a small serving bowl. Serve with fresh watermelon. If the scoops of watermelon don�t turn out pretty enough to serve, simply puree them to make delicious and nutritious watermelon pops or ice cubes. Pour watermelon puree into popsicle molds or ice cube trays. Drop in desired amount of berries and freeze until solid. Use your artistic creativity to show dad he is special this Father�s Day. Carve him into a watermelon and serve him some ice cold lemonade flavored with melon berry ice cubes.